Glass Painting Course is an event that took place between 24-Apr-2006 and 29-Apr-2006 in Hyderabad. Creativity has always been an inherent human trait. If you're ignorant of yours, here's your chance to find out. The Literacy House, Osmania University, is organizing a six day course for those interested in glass painting. The course is open to all, irrespective of age, gender, and of course, intelligence quotient. Handle with care as it is fragile. Be it faking a stomach-ache to bunking school, or affixing your face to the body of a filmstar's photograph, creativity is an exigent art. This course, though, is a much more productive pass-time. Get to the venue immediately, and start painting. Who knows, you actually might be sketching your future. Please contact Ramalakshmi on 2709-8406/2709-6464 for further details. 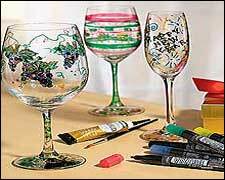 Be the first to comment on Glass Painting Course! Just use the simple form below. fullhyd.com has 700,000+ monthly visits. Tell Hyderabad what you feel about Glass Painting Course!